State Road 408 (Spessard L. Holland East-West Expressway) is the backbone of the Central Florida Expressway Authority’s 118-mile network. The 22-mile toll road runs east-west, connecting Ocoee from Florida’s Turnpike in west Orange County to SR 50 (Colonial Drive) east of Alafaya Trail near the University of Central Florida in east Orange County. At its peak, more than 164,000 vehicles a day travel the 408 as it crosses downtown Orlando. CFX operates all but the 408’s westernmost mile, which is operated by Florida’s Turnpike Enterprise, part of the Florida Department of Transportation. SR 408 provides a faster, more convenient alternative to heavily traveled SR 50, a four- to six-lane arterial road congested with stop-and-go traffic. In certain portions of east Orange County, 45,000 vehicles a day use SR 50, making it one of the busiest stretches of asphalt in Central Florida. It’s no wonder motorists choose SR 408 for its convenient access to communities and corporate and government offices in the city center. SR 408 is the area’s go-to corridor for traveling to Amway Center, Camping World Stadium (formerly the Citrus Bowl) and other downtown entertainment venues, as well as Orlando Executive Airport, SR 436 (and Orlando International Airport), Valencia College, SR 417 (and the University of Central Florida), Lockheed Martin and the Waterford Lakes Shopping district. Dubbed the East-West Expressway, SR 408 opened in 1973 at a cost of $89 million. It ran from SR 50 just east of what’s now Hiawassee Road and headed south, crossing over downtown Orlando and Lake Underhill, then north to SR 50 east of Goldenrod Road. It was formally dedicated the Spessard L. Holland East-West Expressway in honor of Florida’s 28th governor, who went on to serve four terms in the U.S. Senate, retiring in 1971. By 1984, the alignment of the SR 408 eastern extension had been chosen. Construction began in 1987, and the section from existing SR 408 to Rouse Road opened in May 1989. The rest of the six-mile road opened in June 1989, at a total cost of $105 million. This project included a full interchange with the planned SR 417’s Southeastern Beltway (opened in April 1990), the new Dean Road Main Toll Plaza, as well as a connection at the east end at SR 50 to the Central Florida Research Park. An initial connection to Florida's Turnpike and the planned SR 429 (then-Western Beltway) was studied in 1985. Construction of the 4.5-mile extension began in mid-1989 and was completed on Oct. 8, 1990, at a cost of $102 million. This project included adding the Hiawassee Main Toll Plaza. The full interchange with the Turnpike was completed in August 2006 with two access ramps to connect Good Homes Road with SR 408 in both directions. Additionally, the agency widened the Good Homes Road bridge to accommodate Orange County’s widening of Good Homes between SR 50 and Old Winter Garden Road. In summer 2010, the SR 408 widening and improvements continued with new projects between Goldenrod Road and the SR 417 Interchange. Work ended in January 2013 with the final completion of the SR 408/SR 417 North Interchange Project and the opening of the SR 408/Chickasaw Trail Half Interchange Project, which also featured a connector road to Valencia College Lane. In July, CFX unveiled a pilot program called Reload Lane, a drive-up E-PASS customer service booth on both east- and west-bound lanes of the Conway Road Toll Plaza. The first of its kind in the continental United States, Reload Lane offers motorists the convenience of signing up for E-PASS or replenishing their accounts while remaining in their vehicles, with a transaction taking only a few minutes. The program was such a hit with motorists that CFX opened Reload Lanes on other expressways. 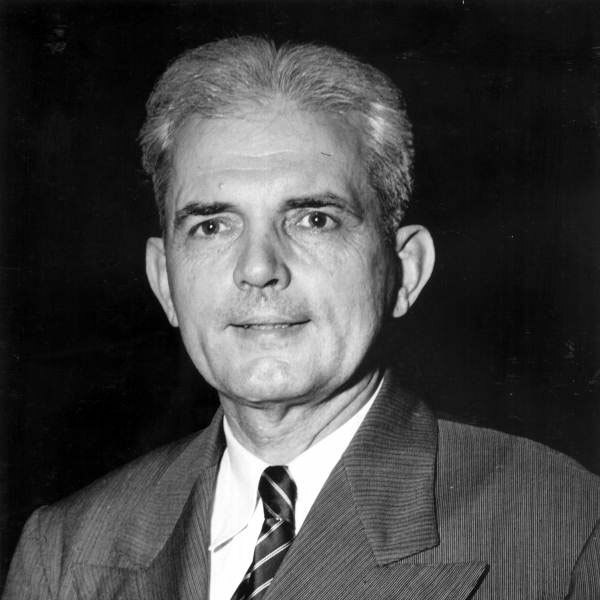 State Road 408 is named for Spessard L. Holland, Florida’s 28th governor and a U.S. senator from 1946-71. The agency honored Holland for his public service with a naming ceremony shortly after he retired from Congress in 1971. Holland’s private life included serving in World War I as an aviator, for which he was awarded the Distinguished Service Cross, and a legal career that spawned the creation of Holland & Knight, an international law firm. He died in 1971 at age 79. Lake Underhill Bridge is a gateway crossing, with decorative towers and faux stay cables greeting SR 408 travelers heading toward or away from downtown Orlando. Located just south of the Orlando Executive Airport on the northeast side of the city, the bridge opened in 1973 as a six-lane crossing. An expansion plan doubled the number of lanes and added aesthetic elements to the bridge in 2009. An 1,800-foot pedestrian bridge opened the following year. 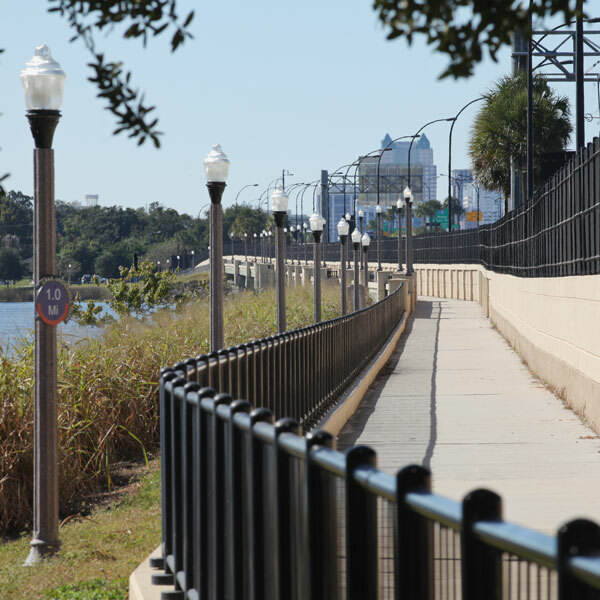 Lake Underhill’s pedestrian bridge is now part of the 2.5-mile Lake Underhill Path, a popular jogging and walking trail for residents and a popular site for photographers. 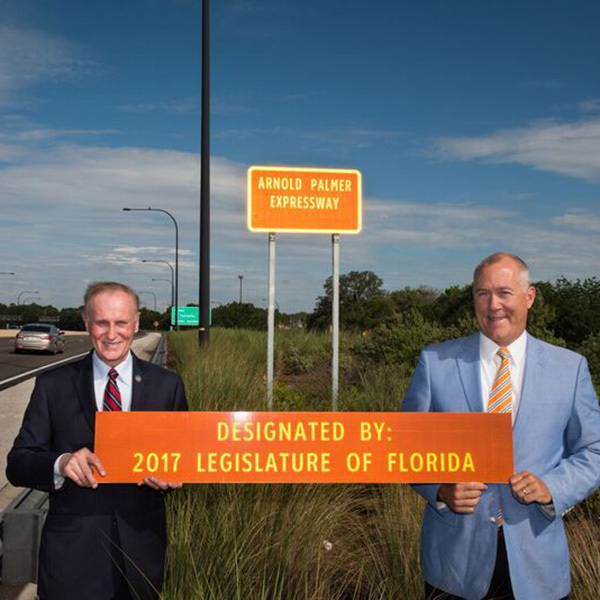 In June 2017, CFX named a section of SR 408 the Arnold Palmer Expressway in honor of the late golf legend who had made Orlando his winter home for nearly 50 years. Palmer died in September 2016. He was 87. A month later, CFX’s Board unanimously voted to designate 408 west from Kirkman Road to Clark Road as a tribute to Palmer. Florida Rep. Mike Miller (R-District 47) and state Sen. David Simmons (R-District 9) sponsored legislation that made the designation official the following year.